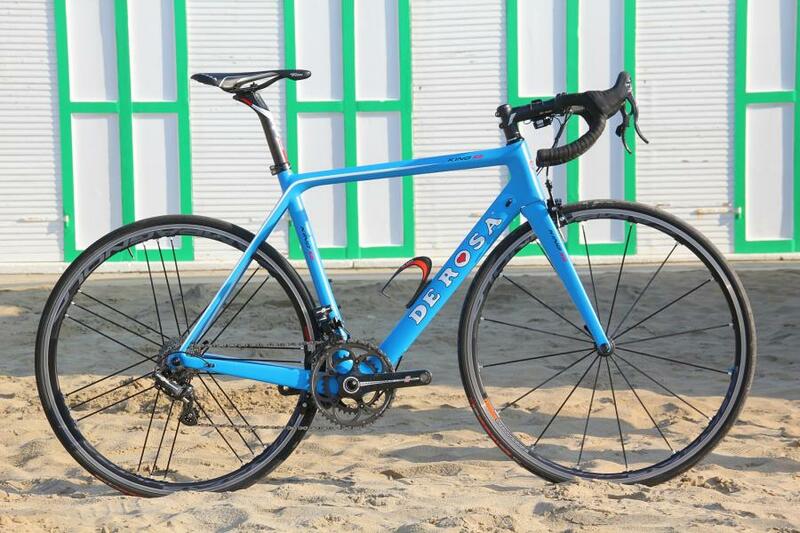 The King XS is a new model from Italy’s De Rosa and the model we’ve been riding this week sticks to the Italian theme with a Campagnolo Record EPS groupset. The frame is made from a combination of T1000, T800 and XN10 carbon fibre, coming with a tapered head tube (1 1/8in to 1 1/4in) that’s designed to enhance front-end stiffness and a slightly sloping top tube. The King XS differs from previous King models in that the rear brake isn’t positioned on the seatstays, it sits behind the bottom bracket. “This new position of the rear brake allows an increase of the braking power,” they say. 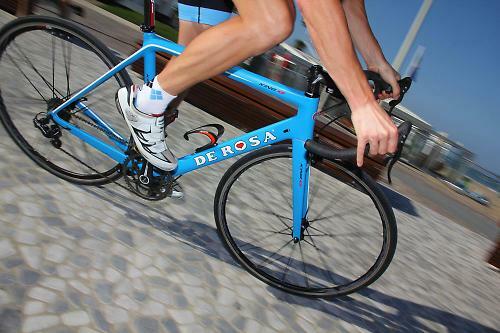 De Rosa have gone for direct mount brakes (from TRP on our bike), both front and rear, meaning that each arm is attached directly onto the frame/fork rather than via a central bolt, the idea being to reduce flex and provide a performance that’s a little bit more, you know, direct. 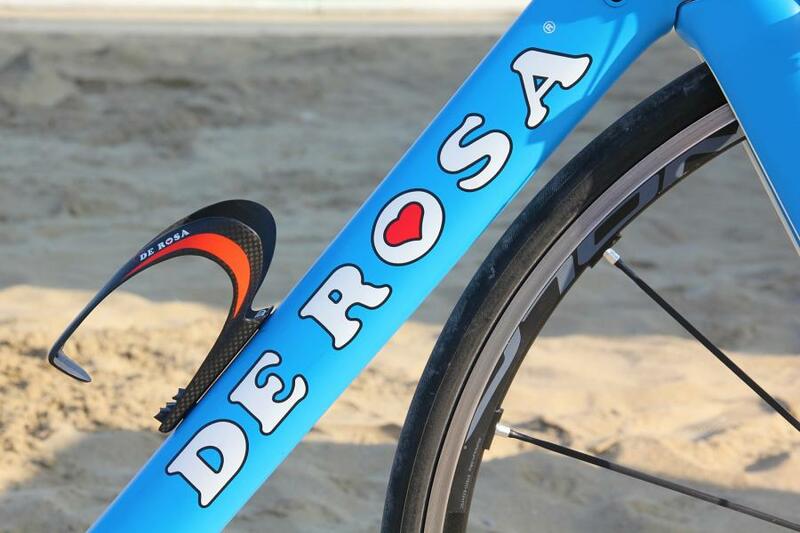 De Rosa have used the opportunity to ditch the brake bridge altogether from between the seatstays and they reckon that this allows them to dial more comfort into the frame. 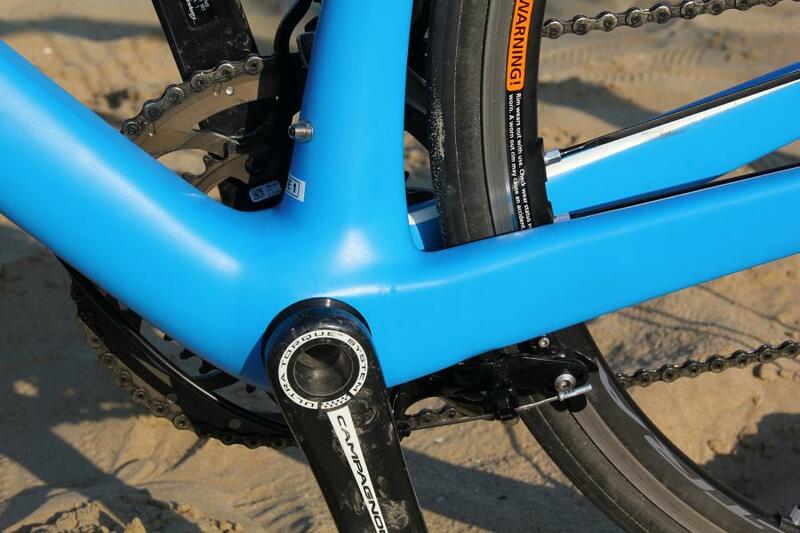 The usual rationale from manufacturers who go down this route is that without the need to make the seatstays beefy enough to cope with braking forces, they can add a little extra up-and-down flex. 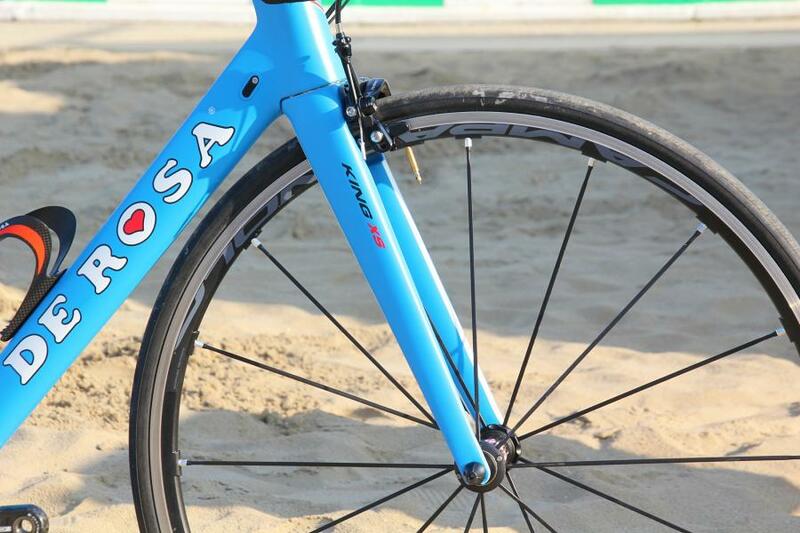 The down tube sits very close behind the front wheel and De Rosa have integrated the fork slightly into the frame. 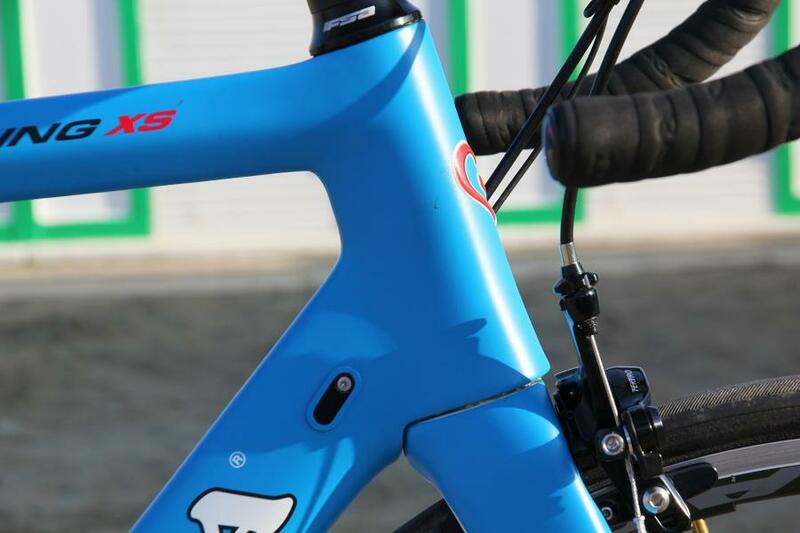 In other words, they’ve taken a notch out of the bottom of the head tube and fitted the upper part of the elongated fork crown in the gap. It’s a really small amount though; the overlap isn’t great. They say that this has an aero benefit and also that it improves the aesthetics. You can make your own mind up on that one but pretty much everyone who has commented on this bike while we’ve been riding it this week has said they think it’s a bit of a looker. 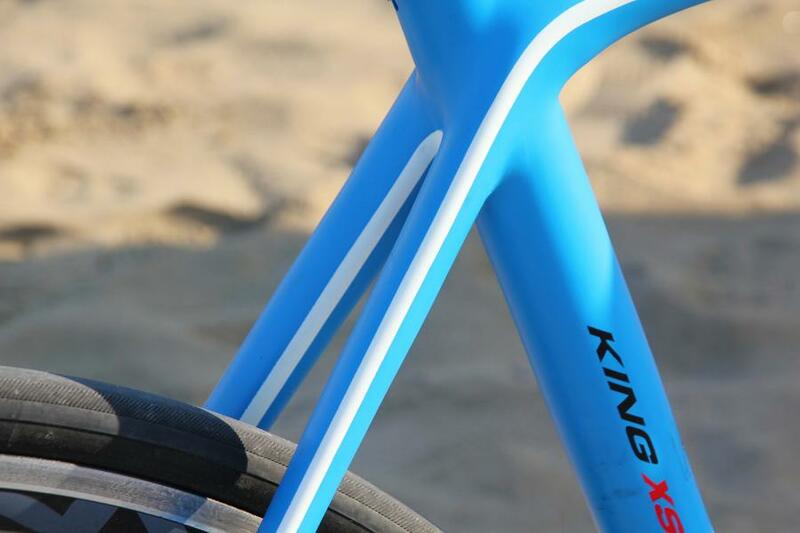 The King XS is built to a race geometry. The version that comes with a 55.5cm top tube, for example, has a 14.4cm head tube. 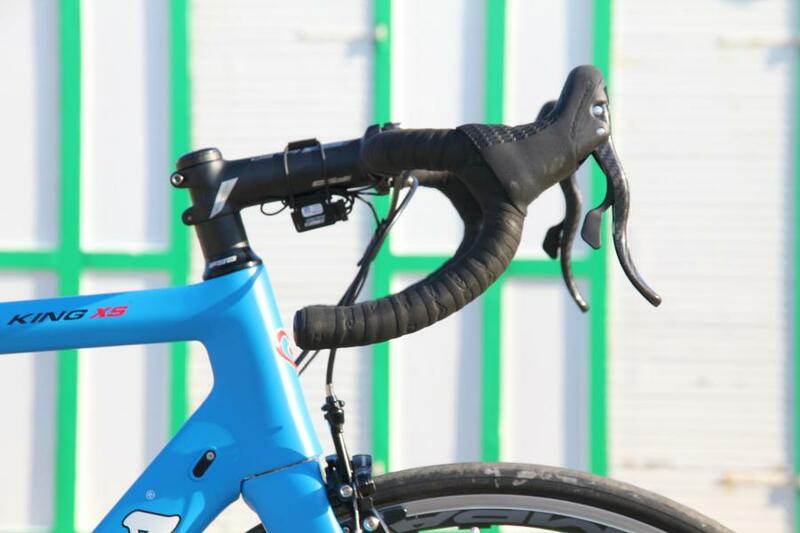 The stack (the vertical distance from the centre of the bottom bracket to the top of the head tube) is 39.3cm and the reach (the horizontal distance between those points) is 54.5cm. The long and the short of it is that this is a bike that puts you into a traditional low and extended ride position. You can, as ever, adjust things via headset spacers, the stem, handlebars and seatpost that you use, but that’s your start point. 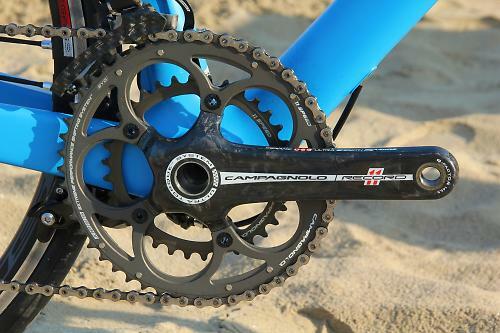 As we mentioned, the bike we’ve been riding this week came complete with a Campagnolo Record EPS groupset. We’ve told you about this equipment plenty of times before so we won’t go into massive detail here, but it’s worth pointing out that some people prefer the feel of Campagnolo’s electronic shifters to their Shimano rivals (equally, of course, many people prefer Shimano; that’s the way with these things). 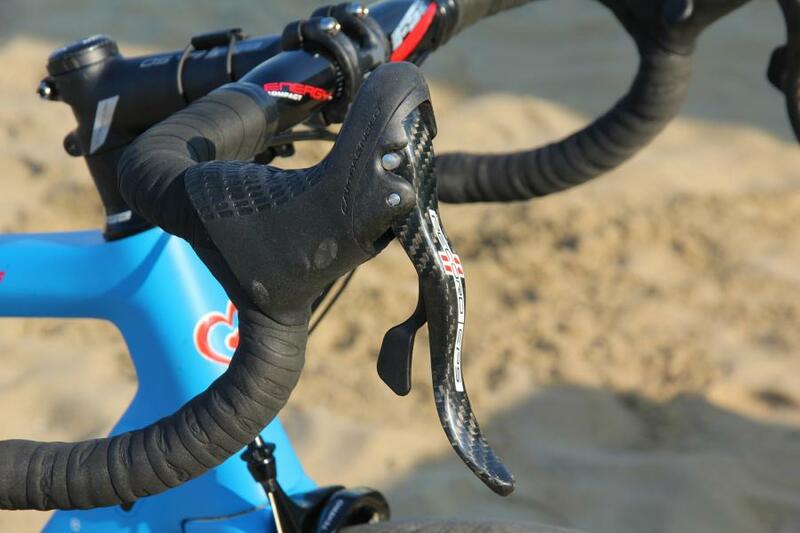 Whereas both the upshift and the downshift buttons are positioned at the outside edge of Shimano levers, with Campag you get one finger-operated lever on the outside and a thumb button on the inner side, as you do with their mechanical shifters. I can’t say I’m particularly bothered either way but some people like the fact that your finger and thumb do different jobs with the Campag system. 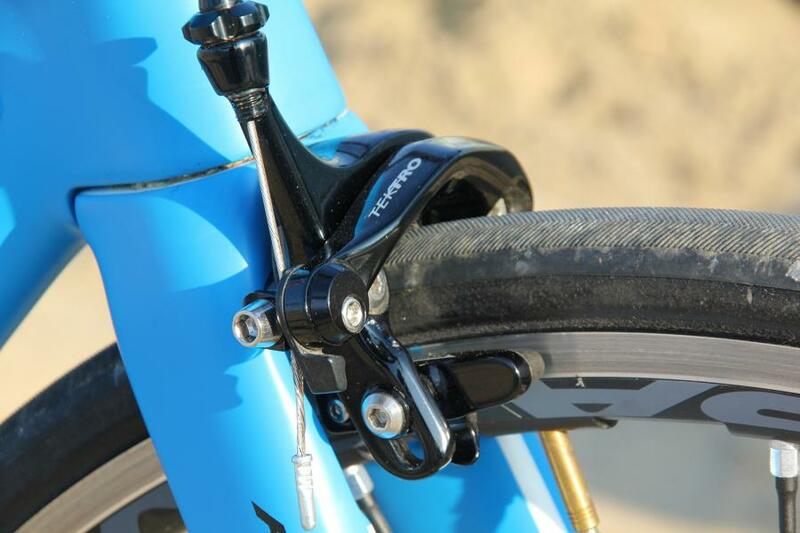 Campag have also engineered a more definite click into their shifters. I find that front upshifts under pressure aren’t quite as snappy as with Shimano, but we do have the existing Record chainset on our bike rather than the new 2015 one. Oh, nearly forgot, the EPS battery is hidden away inside the frame, as is usually the case now, with a recharge point on the seat tube making life that bit simpler. Talk of the components is largely academic, though, because De Rosa’s UK distributor, iRide www.i-ride.co.uk, is importing the King XS as frameset only rather than as complete bikes. It comes in both black and white and is priced at £2,999.99 – okay, we’ll call that three grand. 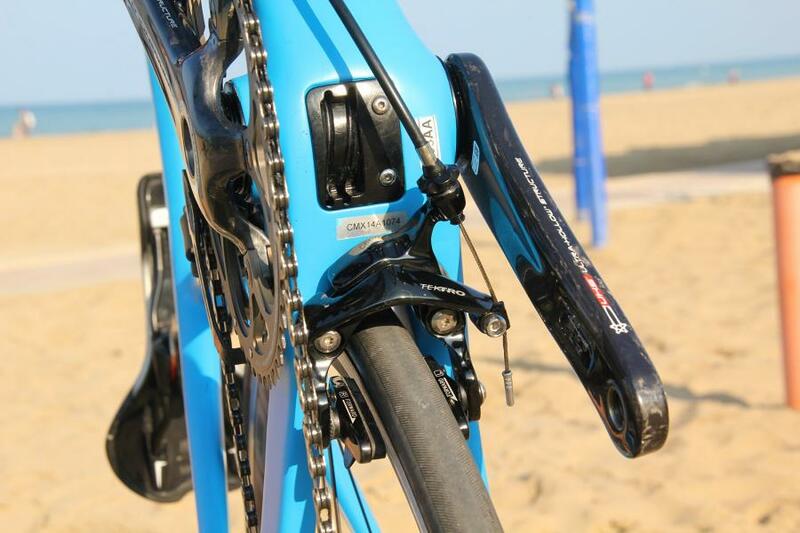 That includes the seatpost but not the brakes. Obviously, you can get your local dealer to build it up however you like. 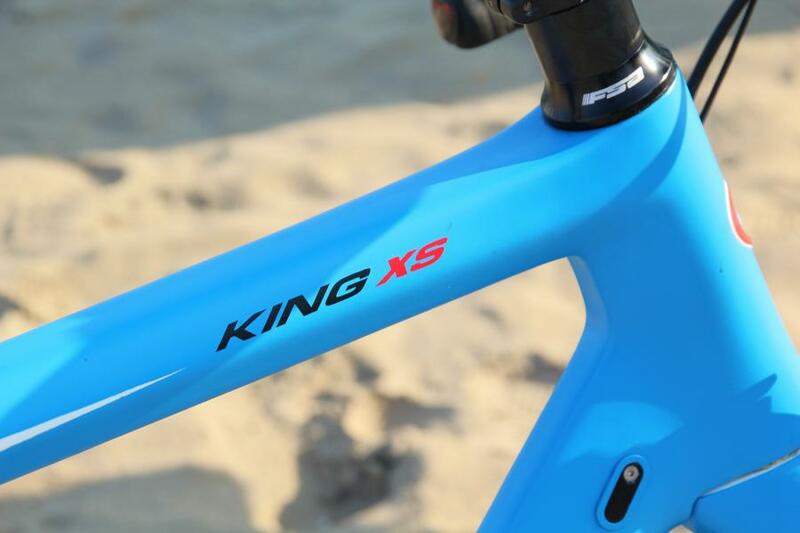 Out on the road, the King XS is a sweet ride. A light weight helps, our complete bike (Campagnolo Record EPS groupset, Campagnolo Shamal Ultra wheels, TRP direct-mount brakes, FSA handlebar, stem and seatpost, no pedals) weighing in at 15.3lb (6.96kg). 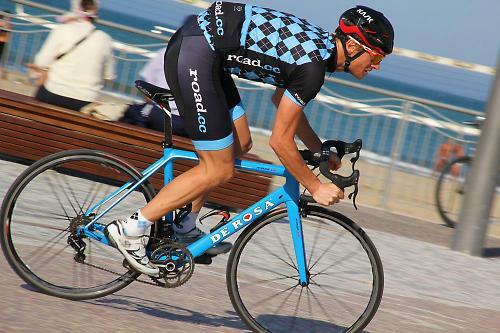 That makes for a bike that gets off the mark fast and jumps into life on the climbs as soon as you crank up the power. As mentioned, the TRP brakes don’t come as part of the package but I can tell you for sure that they do work. We had a nasty situation on a descent yesterday (fast, sweeping corner, stationary vehicle in the middle of the road) that involved me braking very, very hard and they got me out of trouble, so all good on that front. The bike felt good under hard braking too: stable and in control rather than vague or flighty. The more surprising characteristic of the ride is the level of smoothness you get here. There are some pretty ropey sections of back road around where we’re riding in Italy and this bike takes the sting out of them very effectively. I couldn’t tell you whether that’s down to flex in the stays or the fact that the sloping top tube means there’s a lot of seatpost extending out the top of the frame, but there’s certainly an absence of chatter over the rough stuff. For more info visit i-Ride’s website. road.cc is in Italy from 4-11 October at the Belvedere Hotel in Riccione. Visit the Italy Week page to find out what we’ve been getting up to.